The harbor is close to the center of town. If more than one cruise ship is visiting , one will be anchored and use their tenders. There is a shuttle bus to take you from the bottom of the gangway to the entrance of the port about a half mile away toward town. There is a massive expansion project underway in Torshavn, with 900 meters of additional berth space to be added by late 2019. The Vikings founded the first parliament on Tinganes around year 900. The town has grown considerably during the last century and has now merged with its neighbors: Argir to the south and Hoyvík to the north. Tórshavn is by far the largest town in the Faroe Islands and it is also the capital. The town is a charming blend of old and new. In the area around the harbor lies Tinganes. This is where the government is located. The ‘old town' of Tórshavn is also here. The cute and small houses have been restored over the last years and the area has turned in to a cosy place where people want to live. Skansin is located over the harbor. This is an old fortress built in 1580. It was built in order to defend Tórshavn from pirates. Five minutes walk from the harbor is the city-center Vaglið. Here is also Løgtingið, the Faeroese parliament. Nearby are also shops, restaurants, hotels and a cinema. 5-10 minutes more walking leads to SMS, which is a modern shopping, enter with lots of shops, banks and restaurants. This is the place where people in Tórshavn meet and exchange the latest news while shopping. Tórshavn is a cosy town that mainly consists of small houses in every colour. It has all that it takes to be a tiny little capital: shopping center, restaurants, hotels, cinema's, tourist-information, disco's, sports arena's, swimming-center etc. A tour by taxi is a good option here. About 60-70 Euro per hour. In 2 hours you can see most of the highlights of the island: grass topped building; churches; and Viking dwellings. The capital Tórshavn offers an efficient local bus service (Bussleiðin) , at no charge!, with four routes that reach most areas of the town. The red colored buses operate every half hour during the day and hourly in the evening and on Saturdays and Sundays. Kollafjørður is also included in the local bus service. 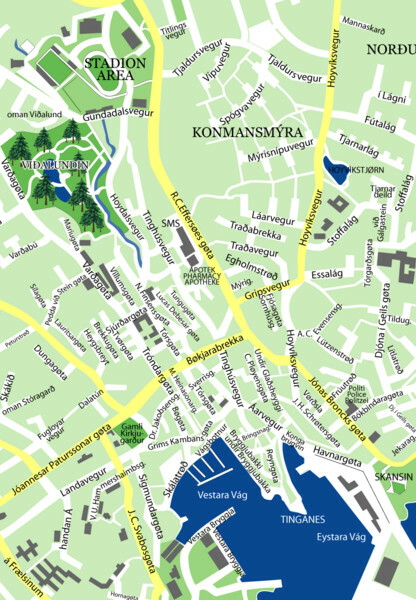 Route maps and schedules can be obtained on the buses, at Kiosk Steinatún in the center of town, or at Kunningarstovan.